Can you hear that? That’s the sound of me typing this article out on my new typewriter. Yes, it is still 2014. I’m just trying out Hanx Writer, a typewriter app for the iPad, brought to you by Tom Hanks. Yes, that Tom Hanks. 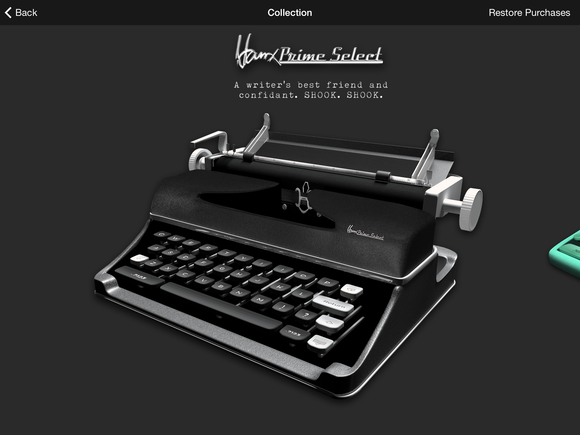 Hanks collects typewriters and built this app as a bit of a passion project—in fact, if you download the app, you can read all about it in an opening letter written by Hanks himself. The fact that it is typed out in an old timey font makes it feel like Hanks wrote that letter just for you. Hanks cares, so he typed up a letter just for you. There’s something nostalgic and oddly satisfying about typing on a typewriter overlay on an iPad. 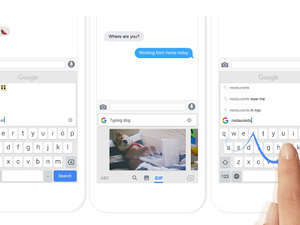 The bottom half of the screen shows business as usual, with the keyboard perfectly in place. But the top half of the screen holds a digital piece of paper and a typewriter scroll wheel, and moves just as a traditional typewriter as you type. It even makes authentic typewriter sounds with each keystroke. 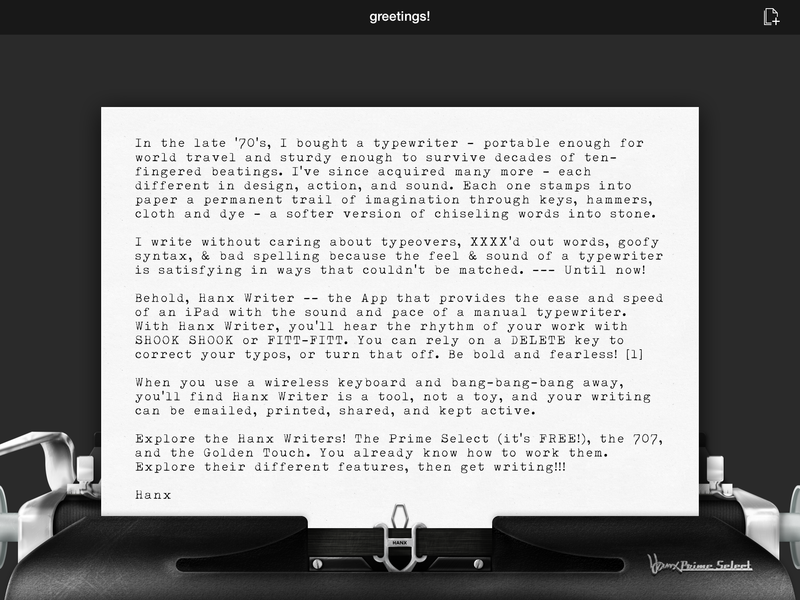 Hanx Writer comes with one typewriter preinstalled—the Hanx Prime Select—but you can add two other typewriters (the Hanx 707 and the Hanx Golden Touch) as in-app purchases. Each machine has its own feel, design, font style, and sound. Realistically, you don’t need all three (and, seriously now, you don’t even need one), but it is pretty fun to write with, and pretty neat to compare how each typewriter performs. Meet the Hanx Prime Select. Though the app is old school, it comes with a few optional modern amenities. You can opt to use the delete key as you would today—meaning, it will actually delete characters as you type—or turn it off if you’d like to be more traditional. You can also hide the cursor, mute the sounds, turn off the animation (as you type, the keys move and the type deck ticks across the page with every stroke), or change font color. The Golden Touch has, well, a golden touch. Listen, this isn’t going to be your everyday keyboard—especially with iOS 8 on the horizon. But it’s worth using for special occasions and personal pieces of writing, because every word seems crafted with care. 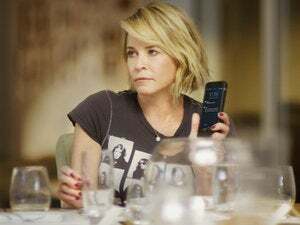 For once, this is a celebrity-made app that is worth a look. Hanx Writer is a free app available in the App Store. The first typewriter comes pre-installed, and each additional typewriter costs $3 a piece (or $5 for both). 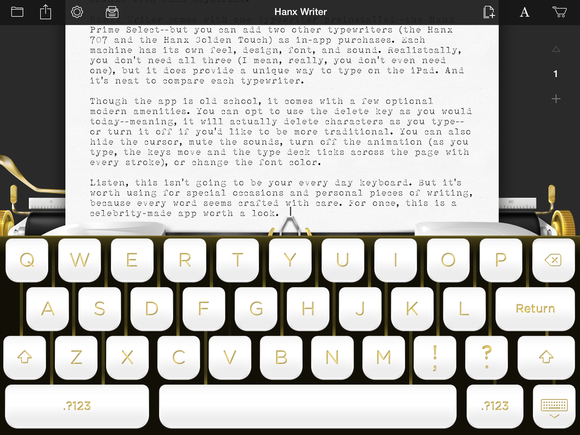 This story, "Hanx Writer brings 1940s typewriter technology to the iPad, and nails it" was originally published by TechHive.